Last Friday through the inexcusable actions of one student, our school community was exposed to some of the worst and most vile racist material most of us have ever seen. The material shared is sickening and does not represent our student body or our community. The material was brought to the attention of administrators by students. Immediate action was taken to remove the material and to find the student responsible. In no way were these materials allowed to be distributed or condoned by the school. We quickly informed all families about the matter, condemning the materials, and communicating clearly that racism will not be tolerated in our schools. Under federal law, the District cannot share details of any matters of student discipline. But students, families, and the public should know that this incident is being taken with the highest level of seriousness. In addition, Huntley police were contacted Friday in relation to this incident, and we are continuing to assist them in their investigation. This incident has touched a nerve not only in our community but across the country. While we wish that society were free from the ugliness of racism, we know that it is not, and we welcome the opportunity for discussion and growth around this most painful topic. Many people have reached out to us from our community and across the country to lend their voice to this discussion. We thank all of them for sharing their thoughts and concerns, and we hope to demonstrate that we are listening. We are working to meet the needs of all of the students who were affected by this heinous act. Counseling support is available for any student who needs it. We are also using this opportunity to open an honest dialogue about issues that exist in our school culture. The District will be working within all of our schools to address and learn from these issues. 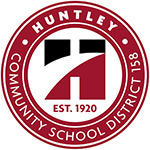 Huntley High School will convene a Student Diversity Summit to promote input and discussion from the school community. More details about this summit will be communicated from the high school soon. Principal Rowe also addressed students during the school announcements this morning. His message is available here. Parents with specific questions regarding their student should contact their student’s building administrator. General questions or comments should be sent to superintendent@district158.org. We are confident that with the support and engagement of our community, we will rise to this challenge and come out stronger and closer.